We see the occasional extreme Muslim cleric on the TV news railing against the west. We hear of the radicalisation of some Muslim youth via immersion in grievance, followed by anger and calls to revengeful jihad. On 14 August we witnessed a similar incident in the Australian Parliament. A political senator called for a return to the White Australia policy, a ban on Muslim immigration, with all further Australian immigration to 'reflect the historic European Christian composition of Australian society'. We experience similar attitudes being expressed on talk-back radio, by certain columnists and bloggers, and by some politicians. Fraser Anning descended a few more rungs of this racist ladder by introducing the harrowing phrase 'final solution'. Its use from either ignorance or design proves him unfit to serve. Despite this, the leader of his party praised the speech. Speech after speech in both houses of the Australian Parliament was swift and appalled, condemning the senator's words. A Jewish MP and a Muslim MP embraced on the floor of the House of Representatives. A Muslim MP wept as she asked how many more times she had to stand up against hate and vilification. The Prime Minister and Opposition Leader shook hands after both speaking against the racism. Whether he likes it or not, Anning's speech mirrors that of any extreme Muslim cleric. They are 'enemy twins' and their circumstances echo each other. Similar esteemed platforms are used to accuse and berate: the Mosque and the Parliament. Forced exclusion is the answer to the problem that each sees in the presence of the other. Muslim pressures and threats to conform in some countries are echoed by the Australian senator's call — and that of other fringe Australian politicians — for the exclusion of Muslims. Extreme Muslim fanaticism has seen attempts to form Caliphates, imaginary nirvanas where everything would be utterly kosher in a Muslim sense. The senator's speech similarly harks back to a golden age where (it seems) everyone had a job, necessities were cheap, banks were controlled, speech was free and government was small. For aggrieved Muslims, everything is the fault of the rapacious Christian west, and for the aggrieved senator, everything is the fault of anyone who does not resemble the European Christian. 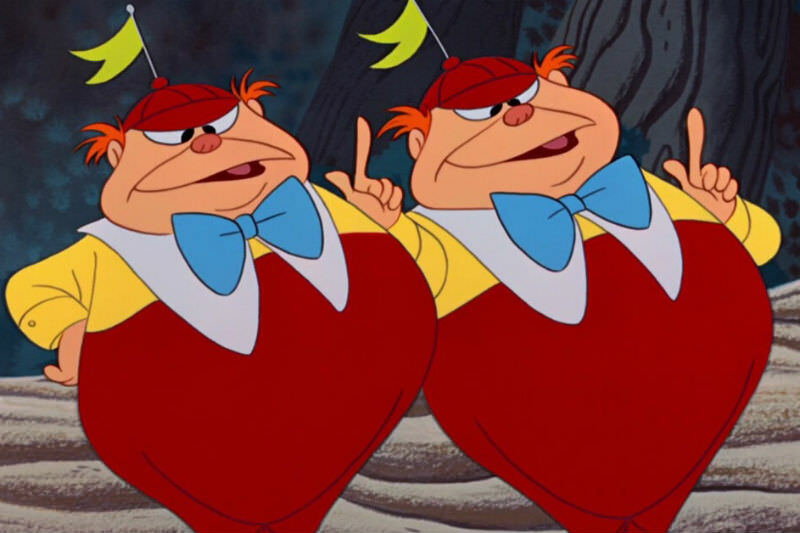 Tweedledum and Tweedledee reign supreme. "The mutual accusation of enemy twins gives rise to perpetual revenge, the turning-point of much of today's world, and the subtext of the rivalry of certain politicians and clerics." Anning's mention of Christian values to which he desires that Australia return is indeed ironic, for it is that very Christianity which reveals the instability of the structure which he champions. In this respect, Girard has wonderfully presented the breakthrough which the Gospel has brought to human consciousness, one that is crucial to understand. The Gospel once and for all reveals God's answer to human crises and dilemmas: renunciation of violent reprisal against the other. The teaching, life, death and resurrection of Jesus Christ unveils the innocence of victims who, from time immemorial, have been used to displace the fear and aggression which arises in human communities. As elusive and difficult as it may be, the ultimate way to reconciliation and harmony is forgiveness. In contrast, the mutual accusation of enemy twins gives rise to perpetual revenge, the turning-point of much of today's world, and the subtext of the rivalry of certain politicians and clerics. Each believes the other is the aggressor and each will invariably find enough evidence of the other's wrongdoing to bolster claims of victimhood. The scenes of united opposition to the senator's divisive speech have a number of causes. MPs are responsible to their constituents in our multicultural nation and they would want to ensure that the fabric of cohesion is not torn further. But the underlying cause of their condemnation of the speech is a product of the influence of Christian values, one of which is the revelation that the targeting of minorities is victimisation. This is not to say that Christians invariably live this fundamental tenet. The plight of asylum seekers testifies to the Australian willingness (Christian or otherwise) to use victimisation when it suits. The racism such as that favoured by the senator must be strongly opposed. But it would be a mistake indeed were we to attack him personally in the ways he has attacked others. Becoming enemy twins is not beyond any of us. Susan Connelly, a Sister of St Joseph, has been involved in education as a primary school teacher and principal, and has also taught scripture in state schools full-time for ten years. She has had extensive involvement with the Timorese people, mainly in cultural pursuits and justice advocacy. Recent articles by Susan Connelly. Thank you Susan for this very apt analysis. It is good to see Girard being brought appropriately into the current discussion on race, religion and immigration. Your twinning of the fanatics on both sides is a breath of fresh air. How alike we are, not how different. A beautiful and inspiring article. As a mother and grandmother I'm left pondering what can be done to break the cycle. Great article Susan - rather sticks in the craw having Senator Anning looking for Christian restoration.